For most people, a television breaking or a computer shutting down is annoying at best. It means they’ll have to embark on the often drawn out process of choosing a newer, more expensive version to purchase. Fortunately, Mark Schroeder isn’t most people. That innate curiosity is what guided him toward a career in science. 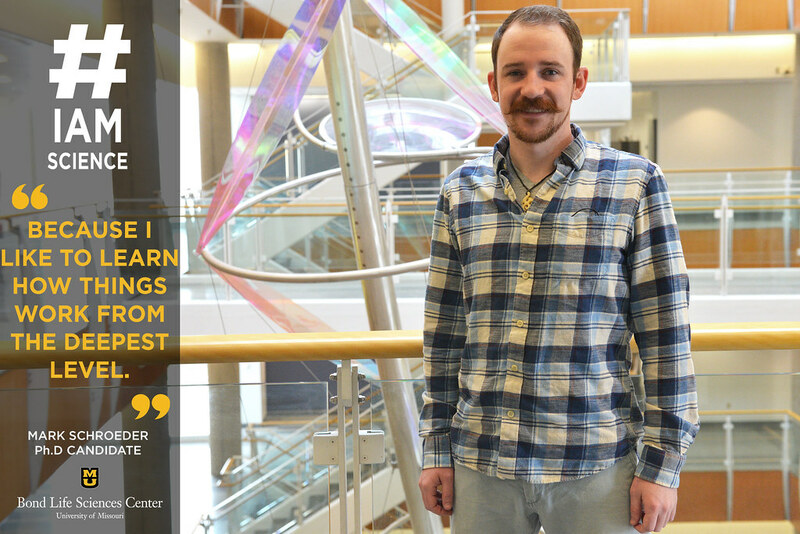 As a graduate student in biochemistry, Schroeder now works in the Lloyd Sumner Lab in Bond LSC where dives deeper into how things work. Specifically, the lab has two main research interests: plant natural products and metabolomics. They use a model legume plant, Medicago truncatula, because it is rich in natural products. Once as they identify the small molecules, Schroeder and the rest of his lab can do comparisons between samples, such as disease tolerant and more susceptible plants. This means they can investigate two different samples and determine exactly what is different, an insight that might lead to agricultural or medical applications. To do their work, they use cutting-edge technology. While highly useful, it can require some troubleshooting. And Schroeder doesn’t mind being in the lab at all. In fact, it was something he’s always wanted to do.